In response to Spain’s decision, Mr. Salvini tweeted: “Victory! 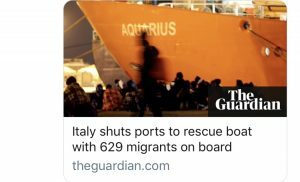 629 immigrants aboard the Aquarius ship [are heading] in the direction of Spain, first goal achieved.” Experts and NGOs anticipate a mass deportation of irregular migrants in Italy in the weeks and months to come. This, notwithstanding the fact that 41.8% of migrants arriving into Italy receive some form of protection and maintain a legal right to remain in Italy under Italian law (as of December 2017). Italy’s message is loud and clear: we are criminalizing migration and migrants are no longer welcome. ©2018 PathFinders Justice Initiative, Inc.